Okay, you'll notice that all these books are by the same author. That's because I reviewed the first book in his Marquette trilogy, Iron Pioneers, and liked it very much that the author asked if I would like to review his other books? Of course! By the way, this meme is hosted by Marcia at The Printed Page. You should check out her blog and see what others have received and to play along. 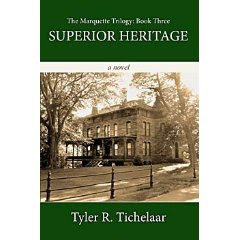 The Marquette Trilogy comes to a satisfying conclusion by bringing together characters and plots from the earlier novels and culminating with Marquettes 1999 sesquicentennial celebration. Madeleine Hennings story is finally revealed as secrets from the past shed light upon the present. The novels main character, John Vandelaare, is descended from all the early Marquette families in Iron Pioneers and The Queen City. While he cherishes his familys past, he questions whether he should remain in his hometown. Then an unexpected event changes his life forever. 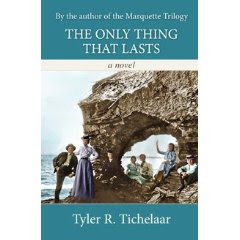 About The Author: Tyler R. Tichelaar, PhD and seventh generation Marquette resident, was raised on tales of his hometowns past. Superior Heritage is the third in his trilogy of novels celebrating Upper Michigans history. Narrow Lives is the story of those whose lives were affected by Lysander Blackmore, the sinister banker first introduced to readers in The Queen City. It is a novel that stands alone, yet readers of The Marquette Trilogy will be reacquainted with several familiar characters. Written as a collection of connected short stories, each told in first person by a different character, Narrow Lives depicts the influence one person has, even in death, upon others, and it explores the prisons of grief, loneliness, and fear self-created when people doubt their own worthiness. About the Author: Tyler R. Tichelaar, Ph.D. and seventh generation Marquette resident, was raised on tales of his hometowns past. 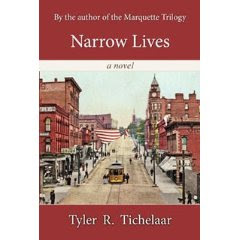 Narrow Lives is his fourth novel, following his popular Marquette Trilogy. The Only Thing That Lasts is written as the autobiography of Robert ONeill, the famous novelist first introduced in The Marquette Trilogy. As a young boy during World War I, Robert is forced to leave his South Carolina home to live in Marquette with his grandmother and aunt. He finds there a cold climate, but many warmhearted friends as he matures into adulthood and becomes a famous writer. The Only Thing That Lasts is a joyful, lighthearted, yet meaningful story of home and hearth. Mr. Tichelaar says of this work, The Only Thing That Lasts is the first novel I ever wrote. I wanted to write an old-fashioned novel in the style of Louisa May Alcott or L. Frank Baums Aunt Janes Nieces, or even Marquettes own Carroll Watson Rankin, whose Dandelion Cottage first made Marquette the setting for a novel. Andrew Graham never settled down and loved again after losing the love of his life. Throwing himself into his music, he fuels his passion through the strings of his violin. Once he stops in Welshire to play for the royal family, a beautiful princess captures his interest and his heart. Soon he finds himself on the edge of a romance that will test his ability to trust and love once again. Voice of Abandon or, The Princess and the Violinist is a sweet, classical novella that proves life and love can begin after loss. Especially when you least expect it. Wow! What a great stack of books! They all sound really interesting! Happy reading! 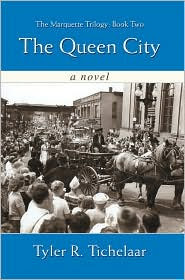 I got excited when I saw The Queen City - I thought you got a book about Charlotte at first. Great mailbox!